Wheat Thins just came out with a new advertising campaign right after my own heart. It fuses new media with traditional media in a seamless experience tied directly to the essence of the brand. 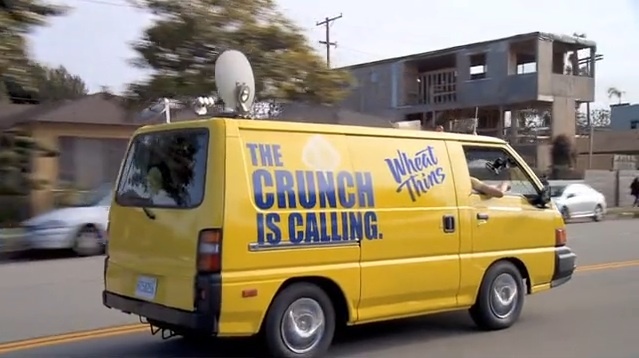 In the new television campaign, which by the way is posted all over YouTube, a Wheat Thins branded van visits unsuspecting Wheat Thins fans who have posted tweets about their love of the brand. The brand spokesperson, on film, then fulfills the tweeter’s request which is generally all about the “crunch”. Brilliant and very engaging, I could watch them over and over. Not a brand new idea, certainly, but I love the use of real followers on Twitter in a mass advertising vehicle. You can watch a couple here. Notice how everything is branded with a signature yellow color? And all tied to the “crunch”. Great use of two elements (color and sound) to make more memorable branding. Note to self: Old Spice isn’t the only game in town. How Well Do You Know the College Market?